I just wanted to thank you all for a wonderful summer. I had so much fun and learned so much. I also gained so much not just as an actor but as a person. And thanks to all of the wonderful teachers I went into the audtitions for the plays at the University of Toledo where I attend I used what I learned and went in there and audtitioned with no apologies, and landed the role of Dunyazade in "Arabian Nights." Everyone here at Toledo have noticed a difference in my acting also and keep commenting on how much stronger I've gotten. You guys have an amazing place that I would recommend to anyone in a heartbeat. Keep up the amazing work! I just finished my first round of auditions for my school's department shows since my summer at AMS and I had to write to you immediately and thank you, because the institute this summer completely changed me as an actor. I did a full Williamson warm-up before my audition, and felt loose and confident and ready when I entered the room. It was a group audition, which I used to feel really shy about, but today I had so much confidence and was so open and had no apologies. Everything we did this summer fed into this audition and no matter what happens with it, I had fun with it, and know that I am a different and better actress after studying with you and your staff this summer. Thank you, thank you, thank you. I can't say it enough. Thank you so much for the beautiful opportunity and all the wonderful memories! I recently finished "Anna in the Tropics" at FIU and I could never have tackled the role of Ofelia (a 50 year old Cuban Woman) without the skills I developed at your school! I hope we can work together again very soon ! Also, many of my classmates are very interested in your Summer Intensive after seeing the transformation the six of us had last summer. "The Actors Movement Studio Summer Conservatory was a unique experience because not only did it allow me to tap into emotional resources I had not previously explored, but it also provided a one-of-a-kind bonding experience that has yet to be repeated. I am fascinated by Michael Chekov technique and I still use viewpoints in my current projects. It was a pleasure to play Oscar Wilde in the Salon because not only did it give me a chance to really perform, but it also gave me the opportunity to learn a lot about what went on in the personal life of a genius whose work is a classic and a must for everyone who's interested in theater and life in general. My experience that summer is one I could not speaking of for several months after it was over and it is one that I still think of when people ask me for recommendations for where to spend their summer." 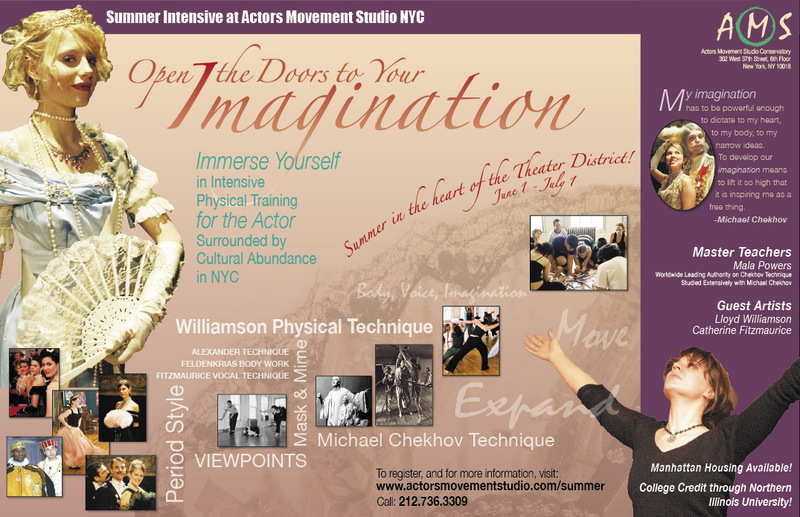 "My experience at the Summer Intensive Institute of 2005 was incredible. I learned so many things not only about the dramatic craft but about myself, too. I experienced how to "let go" and be. I am a big fan of Williamson technique and Michael Chekhov technique. Catherine Fitzmaurice was also very helpful, I learned all these amazing exercises which help me open my voice even more." 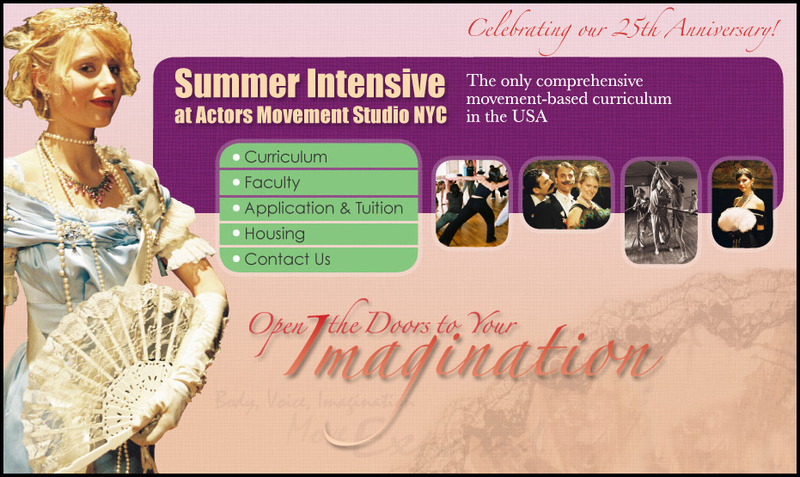 The AMS Summer Theater Intensive for Actors :Curriculum includes a variety of physically based techniques and is specifically designed to develop the actor’s Imagination voice and body, the total Instrument. Students will be immersed in an intensive program with Master Teachers and Guest Artists while surrounded by the cultural abundance of NYC. For twenty-five years, AMS has offered physical training for the actor. AMS has been featured in SHOWBUSINESS, The Soul of the American Actor, and the critically acclaimed book by Nicole Potter, Movement for Actors. Our Faculty has taught at major universities, studios and conservatories including: Tisch School of the Arts (NYU), A.R.T./ Harvard, The University of the Arts, Yale School of Drama, Mason Gross School of the Arts ( Rutgers University), Julliard School, Brown University, Bard College, Northern Illinois University, Florida International University, University of the Arts, American Conservatory Theatre,Williamstown Theater Festival, The Actors Studio MFA Program, among many others. Located in the heart of Manhattan’s theatre district, students will experience the professional atmosphere of the performing arts capital of the world. Affordable student housing is available for all attendees and just ten minutes from AMS!